These Burner TPs are primarily a distance ball. They have an "HPF 1000 SpeedMantle169" which increases ball speed and reduces spin from your driver, but increases iron spin. ("DUHHH... HOW DO IT KNOW?") The cover is made of iothane and is very durable. The ball has a soft feel compared to a Top Flite or a Pinnacle, but not when compared to the TP Black and the TP Red. 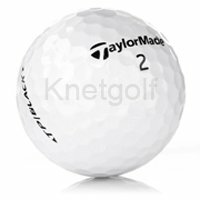 I would recommend these balls for the mid to low handicappers that aren't quite ready to blow $40 to $50 a dozen on premium golf balls. These are the next best thing. The ball is a bit harder, and won't have the same sweet feel around the green as the premium balls, but it will certainly go far and spin on the green. Finally, if you do want to consider the next step up, take a look at the TP Black and the TP Red. They are very similar balls, only the Red doesn't spin as much on the green with your approach shots.